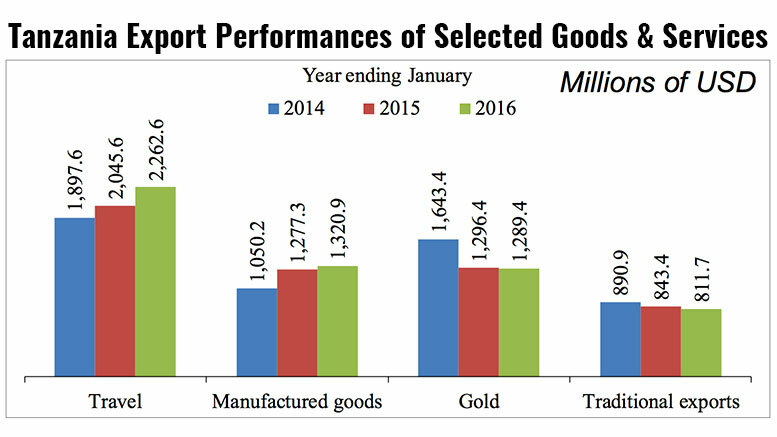 The Bank of Tanzania (BOT) Monthly Economic Review for February 2016 recently published shows that the value of export of goods and services in the year ending January 2016 increased by +8.6%, reaching USD 9,558.7 million, compared with USD 8,795.1 million in the year ending January 2015. The improvement was mainly driven by increase in travel (tourism) receipts and exports of manufactured goods, BOT explains. Travel maintained the leading position among foreign currency earners, before manufactured goods, gold and traditional exports, with USD 2,262.6 million worth of exports in the year ending January 2016, showing a year-on-year increase of +9.5%. Manufactured goods increased by +3.4% to reach USD 1,320.9 million during the same period, thanks to increased exports of sisal products, cotton yarn, plastic items and textile apparel. By contrast, the value of gold exports declined slightly by USD 7 million (-0.53%) to USD 1,289.4 million a result of a fall in both volume and export prices. Traditional exports declined by -3.8% to USD 811.7 million from USD 843.4 million, largely because of a fall in the value of cotton, cashew nut and cloves, which was largely driven by fall in prices in the world market, with most commodities declining in January 2016 compared to the levels registered in the preceding month. By contrast, the value of Tanzania’s total exports of coffee, sisal, tobacco and tea increased during the period under review. However the price of coffee, Tanzania’s 3rd largest Traditional Exports after tobacco and cashew nuts, with USD 162.1 million in the year ending January 2016, also decreased, largely due to favourable crop prospects in Brazil and Vietnam. The value of non-traditional exports increased by USD 406.7 million to USD 4,217.6 million from the level recorded in year ending January 2015. This was largely driven by increase in export values of manufactured goods, fish products, and re-exports.